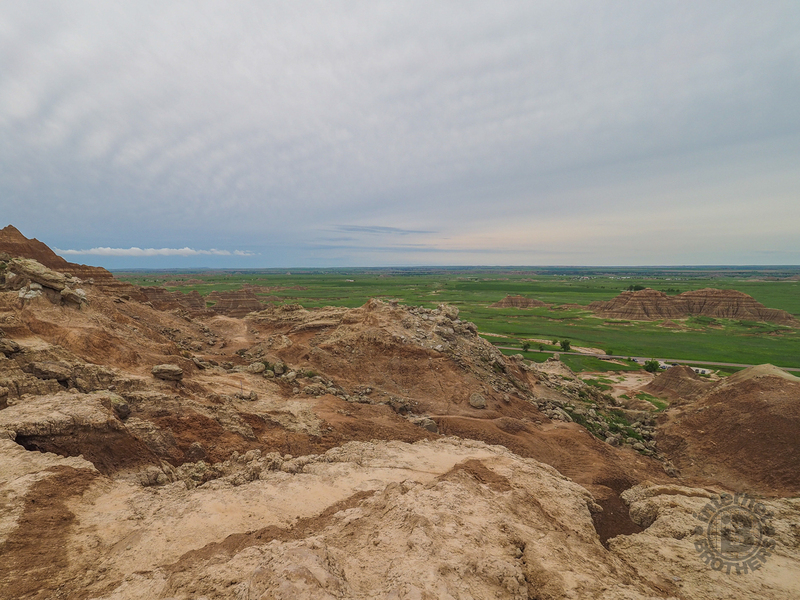 The Castle Trail is the longest in Badlands National Park, but can be broken up with three distinct trailheads. Medicine Root connects with Castle Trail at Saddle Pass and Old Northeast Road creating a loop of about five miles. The terrain is mixed grass prairie and arroyo, with views of the Badlands pinnacles throughout. Keep your eyes peeled for wildlife. It is abundant. Hope for a dry day when hiking in the Badlands. Mud is quick to form and very goopy. My brother Dave and I hiked this loop on Monday, May 28, 2018 beginning at 8:30AM and finishing about 1:15PM. Our plan was to hike the loop clockwise, starting at the Old Northeast Road trailhead, then add a tail to the loop by continuing on Castle Trail toward the Window and Door. Hike Rating: Easy. The entire length of the hike is nearly flat, not strenuous. Trail Condition: Good. Muddy in some places from overnight storms. Otherwise, easy to track and very few obstructions. Starting Point: Dual trailheads on Old Northeast Road. Room for five cars. Trail Traffic: We encountered perhaps a dozen other hikers. How to Get There: From Wall, SD take Hwy 240 to the entrance to Badlands National Park, then travel the Badlands Loop Road to Old Northeast Road and turn right. It is less than a half mile to the trailhead. A few days earlier we hiked the western portion of Castle Trail to Saddle Pass. It was our intention on this day to check out the central area of the prairie, including Medicine Root Trail. This portion of Castle Trail also goes to Saddle Pass where it picks up Medicine Root. We were a bit apprehensive on our way to Badlands National Park, because just like our previous visit, there had been a rain storm the night before. The Badlands become pretty much unhikeable when very wet. The clay that forms the foundation becomes very soft and adheres to everything it touches. When we arrived at the trailhead, there were puddles, but the ground surface seemed to be reasonably firm. Perhaps this would work out after all. We started out on Castle Trail heading west. Unfortunately, for the first half mile, a line of power poles dominates the landscape as it takes electricity to the Visitor Center and to the campground. Once past that, the trail approaches the edge of the Badlands Wall, past deep arroyos that demonstrate the power of erosion. It’s a barren landscape here with very little grass, unlike the other side of the loop. It can be difficult to follow the trail across this landscape. Fortunately the Park Service has recognized that, and strategically placed red stakes to aid with navigation. The next mile the path weaves through a maze of spires, buttes, sod tables, and fins interspersed with open prairie. The spires are to your left (south), while the prairie is on your right (north). I should note the Castle Trail is fully exposed to the elements. There are no trees. There is no shade. If it rains, you will get wet. So come prepared. Sunscreen and a hat are a must, and it’s best to have rain gear with you just in case. At about 2.2 miles you arrive at Saddle Pass, and an opportunity to view the south side of the Badlands Wall. There is a great overlook of the colorful spires erupting from the valley floor 200 feet below, as well as long distance views of the White River Valley and the faraway community of Interior. We happened to arrive when there was a busload of school kids climbing up the pass from below on this Memorial Day holiday. They all wanted to show their friends how high they could climb by scaling the tallest spires and pinnacles. After awhile though, the screaming that went along with that got a bit tiresome, so Dave and I moved on to the Medicine Root Trail. This is the view looking south across the White River Valley from Saddle Pass. Medicine Root heads in a northeasterly direction for a half mile as it takes you away from the Badlands Wall and deep into the prairie grassland. The trail marker stakes are now green to match the prairie. There are places out here where grass is all you can see in every direction. With grass also comes wildflowers. We came across patches of daisy fleabane, goatsbeard, and a meadow with hundreds and hundreds of primrose. Medicine Root is also a bit more secluded. We did happen upon the occasional hiker, but nothing like the Castle Trail. Frankly, there isn’t as much spectacular scenery to see over here, but it’s still different from mountain greenery that I’m used to back home. Perhaps that’s the reason fewer folks come this way. Eventually the trail turns more to the east and continues across open prairie. At one point we came to a place where the trail dropped into a wide, grassy arroyo and we quickly discovered how much water had fallen in the recent storms. While you couldn’t see it beneath the grass, there was at least 2-3 inches of standing water in the arroyo. We quickly looked for a place to easily climb the arroyo wall and get back up on dry land, ending up on opposite sides of the arroyo for a few hundred yards or so. As we continued, we encountered other areas that were somewhat swampy too, kind of tip-toeing our way through. Soon after, we also found a handful of trees, the first we’d seen all day. After about a mile and a half on Medicine Root the trail turns southeasterly and you can once again see the spires and pinnacles of the Badlands Wall… and also the power poles that follow Old Northeast Road. The final half mile of the loop is alternating grass and clay, grass and clay, as we got back to the car and took a break. The air temperature was warming, so I shed one layer, ate a snack, and sat down for awhile. Our plan now was to continue east on the Castle Trail, heading toward the Door and Window area. This section of Castle Trail is on the east side of Old Northeast Road and immediately crosses a wood and iron footbridge over a wash. You walk around a series of Badlands pinnacles and are then hidden from the road. We passed a few other hikers coming in the opposite direction who gave us a tip that there were bighorn rams ahead. As you can imagine, that excited me, so I picked up my pace. We had seen the ewes and lambs on a previous day, but this would be our first opportunity to check out some rams. Half a mile later, there they were, gently taking a siesta on the rim of an arroyo. We took lots of pictures, then left them alone as we continued eastward. One of three bighorn rams we encountered along the eastern section of Castle Trail. 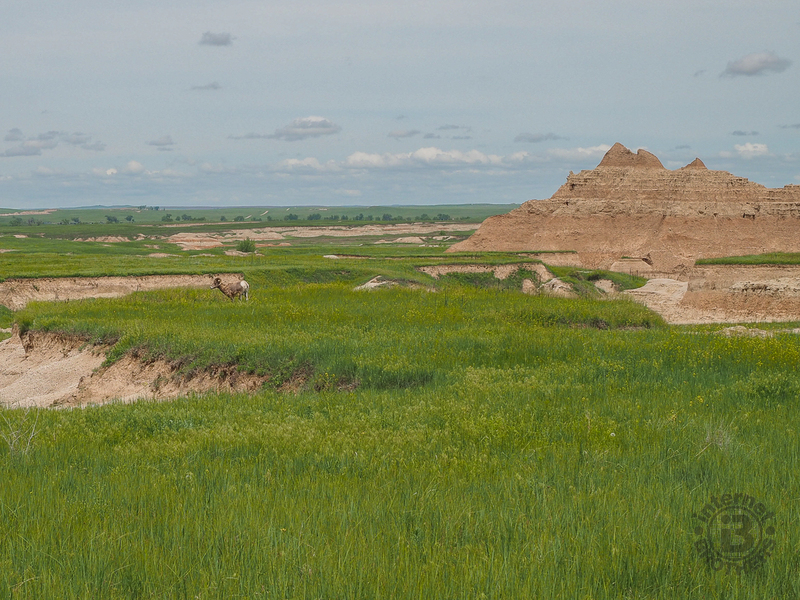 As you continue eastward on Castle Trail, the grass of the prairie goes away, and you wander in, around, and among the Badlands pinnacles and spires. At one point we reached an area where there was nothing but clay. Based on our previous experience with the Badlands mud, we were quite grateful that there hadn’t been more rain the night before. This place would have been impassable. When we got to a point where we could see the major parking lot at the far eastern end of Castle Trail, we decided to turn around. When we got back to the grassy arroyo, the bighorn sheep had moved on, but it didn’t take long for us to find them… or should I say for them to find us. It seemed as if they were following us. Everywhere we went, they came along too. If we crossed an arroyo, so did the rams. If we stayed up on the prairie grass, so too the bighorns, as they would pause and graze for awhile. At one point, as we rounded a turn in an arroyo, there they were no more than 50 feet away. That’s the photo at the top of this post. They never acted threatening, nor of course did we. It just seemed that we were all heading in the same direction. Finally, after a quarter mile, they peeled off and began climbing one of the pinnacles off to the south. I’ve seen a lot of wildlife in my time hiking. This may have been one of the most interesting, and enjoyable, encounters. We were almost back to the car now, passing a few hikers going the other way. We returned the favor and notified them to watch for the rams ahead. After a very overcast morning, the sky was beginning now to finally clear. We could actually see blue, a nice ending to a very pleasant hike. Summarizing the Castle/Medicine Root Loop, this is one that doesn’t require much exertion. It’s pretty much level the whole way around the loop. If six miles is a little too much, you can make it shorter in a number of ways. You can also hike the full length of Castle Trail and back at about 10.5 miles if that’s your thing. Be prepared for weather changes, and cover your skin to prevent sunburn. There’s lots to see along this route, so take your time and enjoy.